Dec 6 (AZINS) Former US President George H.W. 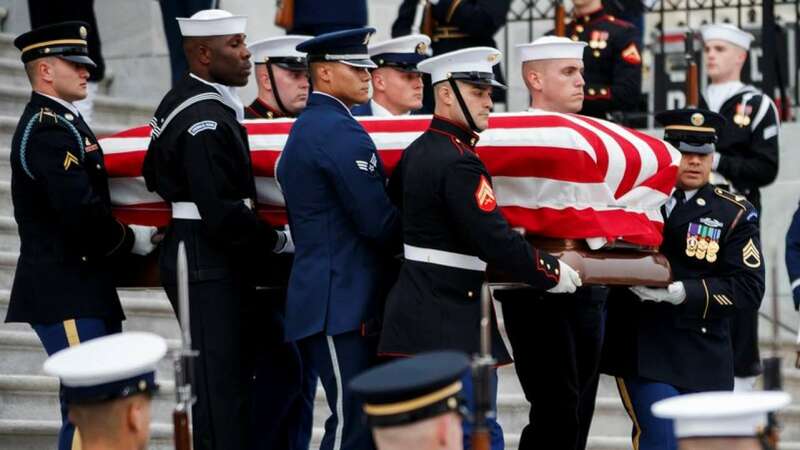 Bush will be mourned on Thursday at the Houston church where he worshipped for many years, a final public farewell before his remains are taken by train to their resting place at his Texas presidential library. Amid an unusual bipartisan spirit at the service at Washington's National Cathedral, both Republican and Democratic politicians honoured a president who called for a "kinder, gentler" nation. "George H.W. Bush was America's last great soldier-statesman," presidential biographer Jon Meacham said in a eulogy. "He stood in the breach in the Cold War against totalitarianism. He stood in the breach in Washington against unthinking partisanship." Bush's remains were accompanied by members of his family and were taken by motorcade to St. Martin's Episcopal Church. Following the funeral at St. Martin's, where Bush and his late wife, Barbara Bush, were long-time worshippers, a train will carry his remains about 100 miles (160 km) northwest to College Station, Texas, where he will be laid to rest at his presidential library. However, he has been remembered as representing an earlier era of civility in American politics, an image burnished in recent years by the divisiveness and anger in the United States that accompanied the rise of President Donald Trump. Bush, who also served as vice president to Ronald Reagan, did not endorse Trump in the 2016 presidential election. He sent him a letter in January 2017 saying he would not be able to attend his inauguration because of health concerns but wished Trump the best.